Welcome! Here you will find just about everything you need to complete your vintage lady head vases. Due to the vast amount of options & choices we offered, its not always possible to list every option. If you do not see the color, style or design you are looking for feel free to email me. If you have any questions or concerns please feel free to email. *International-Due to the triple rise in rates by he United States Post Office on 1/27/2013 I must raise shipping. 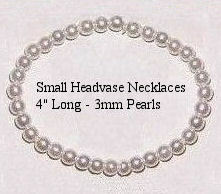 Offered is a handcrafted pearl necklace for your Small Lady Headvase. The necklace is 4" long, but can be custom made to the length of your choice upon request. The necklace duplicates the vintage piece in size and style and is made with glass based (not plastic) Cultura pearls. All jewelry creations are professionally made and completely hand-crafted with the finest quality materials. Your Gals Are Definitely Worth It! Offered is a handcrafted pearl necklace for your Large Lady Headvase. The necklace is 6" long, but can be custom made to the length of your choice upon request. The necklace duplicates the vintage piece in size and style and is made with glass based (not plastic) Cultura pearls. All jewelry creations are professionally made and completely hand-crafted with the finest quality materials. Your Gals Are Definitely Worth It! 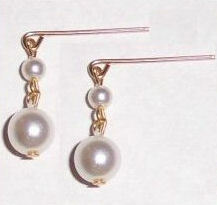 Offered are a pair of tiny handcrafted pearl drop earrings for your 3-5" small Lady Headvases. The earrings are the glue on style and will fit most all small size lady head vases requiring the non-post style, as the earrings are approximately 1/2 inch long in length with "NO EXTENDER". The earrings duplicate vintage pieces and are made with glass based (not plastic) cultura pearls. NOTE: Earrings come in 2 styles, bright gold to look new and tarnished to look aged. Offered are handcrafted pearl earrings for your Small Lady Headvase. The earrings are the glue on style and will fit most all small size lady head vases requiring the non-post style, as the earrings are approximately 1/2 inch long in length "WITH EXTENDER". The earrings duplicate vintage pieces and are made with glass based (not plastic) cultura pearls. Offered are a pair of handcrafted pearl earrings for your Medium Lady Headvase. The earrings are the Glue-On style with the center extender for 5 1/2 -6 1/2" headvases that came with extended pearl earrings. The earrings are made with glass based (not plastic) cultura pearls. Offered are a pair of handcrafted pearl earrings for your Large Lady Headvase. The earrings are the Glue-On style WITHOUT the center extender for 7.5" and larger vases. The earrings are made with glass based (not plastic) cultura pearls. Offered are a pair of handcrafted pearl earrings for your Large Lady Headvase. The earrings are the Glue-On style WITH the center extender for 7" or larger head vases. Earrings are made with glass based (not plastic) cultura pearls. 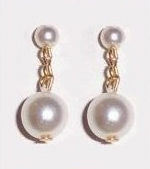 Offered are a pair of handcrafted pearl drop earrings in the post style. These hang down approximately a 1/2" or so. The earrings duplicate vintage pieces and are made with glass based (not plastic) Cultura pearls. NOTE: These earrings come in 3 sizes (6-8-10MM) and 2 styles, bright gold to look new and tarnished to look aged.